I found this recipe in the current Chefs Catalog. It makes either one nine-inch cheesecake or twelve mini-cheesecakes. These sound so good. I was going to post the recipe closer to Halloween, but if you want to make the minies, you will probably need to order the non-stick mini cheesecake pan pronto. 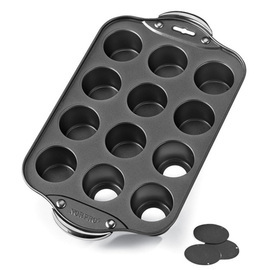 Each well has a removable bottom for easy cake extraction (each round is 1 3/4" deep and 1" in diameter). As they note, the would also be great for mini quiches, tartlets, muffins, hors d'oeuvres and pretty much whatever floats your boat. Lightly butter the wells of the miniature cheesecake pans. Crust: Combine ingredients for crust, mix well, divide among the mini cheesecake pans and press into the bottom. Bake crusts about ten minutes, until set. Transfer to a wire rack for cooling, and lower the oven temperature to 300 degrees. Filling: In a small bowl, combine pumpkin, cinnamon, ginger and nutmetg, and set aside. In the bowl of an electric mixer fitted with a flat paddle and set on low speed, beat together cream cheese and sugar until smooth, 3 to 5 minutes. Add eggs one at a time, beating well after each addition. Add vanilla and beat well. Add the pumpkin mixture and beat well until full mixed, about 1 minute. Pour the batter over the crusts, dividing it evenly among the pans. Bake until filling is set, 20-25 minutes. Cool on wire rack, and then refrigerate at least three hours before unmolding. Before serving, make the cinnamon whipped cream. In a medium bowl, beat the heavy cream, vanilla and cinnamon until soft peaks form. Spoon onto cheesecakes, and sprinkle with nutmeg.